In English the word “dawn” is frequently used to mean the beginning of something – like “the dawn of space travel” would be a reference to the first flight of man in space. This careful chronological statement, “IN the END of the Sabbath, as it began to dawn toward the first day of the week,” was recorded by the sovereign inspiration of the Holy Ghost in harmony with biblical/Jewish days clearly showing that it was before the Sabbath was over, that is before the sunset. 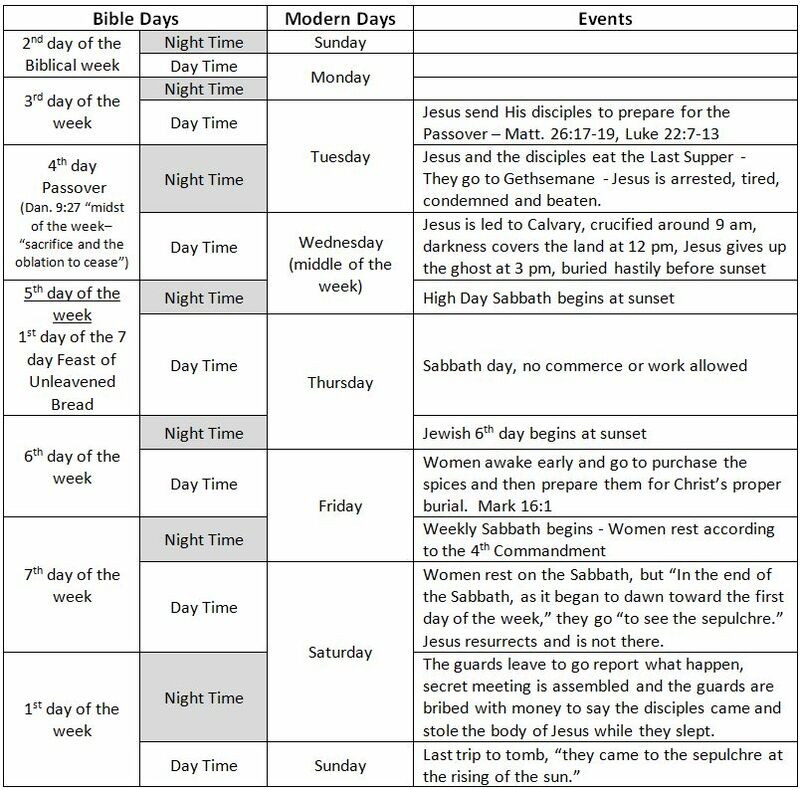 It is during this time frame that the women made their trip “to see the sepulcher.” All the Jews at Matthew’s time would have without a doubt understood Matthew to be referring to the time just before sunset; the end of one day and the beginning of the next. Therefore, the earliest trip to the tomb we can qualify is Matthew’s account which took place “in the end of the Sabbath,” Saturday at sunset. Next, in Mark’s account we see that Mary Magdalene and Mary the mother of Joses beheld where and how the body of Jesus was buried (Mark 5:47). Then, “when the Sabbath was past, Mary Magdalene, and Mary the mother of James, and Salome” purchased sweet spices that when they came to the tomb they might anoint the body of Jesus for a proper burial because His body was prepared and buried in haste “before” sunset prior to a High Sabbath. This is a point that most fail to discern, that the week of Jesus’ crucifixion there were actually two Sabbaths. This “Sabbath” mentioned by Mark is not the seventh day weekly Sabbath, or Saturday, mention earlier in Matthew’s account. This “Sabbath” was day one of seven consecutive days of observance of the Feast of the Unleaven Bread, a “high holy day” and was therefore observed as a Sabbath since no servile work was to be done, see John 19:31. These high holy days “are the feasts of the LORD, which ye shall proclaim to be holy convocations . . . beside [apart from] the [weekly] sabbaths of the LORD,” (Lev. 23:37,38). Lev. 23:5 In the fourteenth day of the first month at even is the LORD’S Passover. 7 In the first day [day fifteen] ye shall have an holy convocation: ye shall do no servile work therein. Let’s assume that Passover was on a Wednesday, which (regardless of such assumption) would have been the fourteenth day of the first month, (Lev 23:2). Then the Fifteenth day would have been Thursday, day one the Feast of the Unleaven Bread, declared by God to be a holy convocation and a High Sabbath. Therefore after the fifteenth day “was past” Friday came, they went out and “bought sweet spices, that they might come and anoint him” (Mark 16:1) and then, “prepared spices and ointments; and rested the Sabbath day according to the [fourth] commandment,” (Luke 23:56). Luke’s account, like Mark’s, mentions the herbs and it being very early in the morning “upon the first day of the week.” However their account differs from each other when it comes to the number of angels at the tomb, one in Mark’s account, two in Luke’s. Also, Mark mentions that it was Salome that was with the two Marys, where Luke says it was Joanna. Mark also tells us that the women “trembled and were amazed, neither said they anything to any man for they were afraid” (Mark 16:8). Yet Luke says that, “Mary Magdalene, and Joanna, and Mary the mother of James, and the other women that were with them told these things unto the apostles” (Luke 24:10). Are these contradictions? Or are these accounts of different trips with a different mixture of people going at different times? Now the Apostle John’s account is completely different from everyone’s in that he states how Mary Magdalene went alone to the tomb and records events unique to her visit, such as her seeing Jesus outside the tomb and mistaking Him as the gardener. Now are all the accounts wrong? Or are some right and others wrong? If so, which ones are which? As believers in the infallibility of God’s word we must believe them all to be correct. Therefore, we must endeavor to place all the pieces of information together according to the clues given and then fill in the blanks with what might have taken place and why . . . this is only a reasoning at best. Mary Magdalene and the other Mary. Which “other Mary” Matthew is referring to we cannot tell for sure. To SEE the sepulchre (tomb). They were not going to anoint the body at this time. The purpose of this trip was to ease their sorrow and pain by visiting the grave of their lost loved one. Matthew does not record the women telling the disciples the news. This may possibly be because the women did not tell for fear of credibility with the disciples. This would account for a second trip in which Mary Magdalene and Mary the mother of James sought to take “other women” with them back to the tomb under the pretense of preparing the body of Jesus as they had earlier planned to. If so, it is likely these new women were told nothing of what the two Marys had seen earlier. Then, with the extra witness of the other women they would be bolder to confront the disciples with the news. 1. Now upon the first day of the week, very early in the morning, they [The first women] came unto the sepulchre, bringing the spices which they had prepared, and certain others [women brought they] with them. 2. And they found the stone rolled away from the sepulchre. Mary Magdalene, and Joanna, and Mary the mother of James, and the other women (Luke 24:10). “Now upon the first day of the week, very early in the morning” (Luke 24:1). Notice the Apostle Luke says nothing in regards to the light of day? That is because it was still dark. This “very early in the morning” was apparently before sunrise. The women came bringing the spices they had prepared to anoint the body of Jesus. Perhaps this was the pretense of the trip (I’ll explain why later) in which Mary Magdalene and the other Mary brought “certain others with them” (Luke 24:1). This first part of the comment by the angels was perhaps a rebuke to Mary Magdalene and the other Mary who were told earlier by the first angel, who rolled back the stone, that Jesus had risen. Not only were they told this, but they had also seen Him as well when they left the tomb earlier. Still, these two angels confirm the message to all the women, “He is not here, but is risen: remember how He spake unto you when He was yet in Galilee, saying, the Son of man must be delivered into the hands of sinful men, and be crucified, and the third day rise again. And they remembered His words” (Luke 24.6-8). “And they returned from the sepulchre, and told all these things unto the eleven, and to all the rest. It was Mary Magdalene, and Joanna, and Mary the mother of James, and the other women that were with them, which told these things unto the apostles” (Luke 24:9,10). How well the women knew the disciples of Jesus. Even though there were many witnesses, the disciples refused to believe. This disbelief of the disciples was probably coupled with ridicule, much like when Peter was freed from prison by the angel and knocked at the door of the house. When the damsel “came to hearken . . . she knew Peter’s voice and ran in told how Peter stood before the gate. And they said unto her ‘Thou art mad!”‘ (Acts 12:13,14). The disciples were frequently given to fits of unbelief and strife amongst themselves. Now to have these women telling them the unheard of, it is not hard to see how they could lash out at these women (even though Jesus Himself told them these things would be). Mary Magdalene, overcome by their disbelief and cruelty returns to the tomb again by herself, questioning herself of all she has seen and heard. 1. The first day of the week cometh Mary Magdalene early, when it was yet dark, unto the sepulchre, and sees the stone taken away from the sepulchre. “The first day of the week . . . early, when it is yet dark” (John 20:1). Mary, upon her return, sees that the stone is indeed rolled away from the opening of the sepluchre. Determined to settle what is going on, she returns this time to find “Peter and the other disciple” and because they did not believe her first report, she now tells them a new report “They have taken away the Lord out of the sepulchre, and we know not where they have laid Him” (John 20:2). But they believed what? They did not believe the first report of Jesus’ resurrection, but they did believe this second report that His body was stolen. “For as yet they knew not the scripture, that He must rise again from the dead. Then the disciples went away again unto their own home” (John 20:3-10). “And they said unto her, ‘Woman, why weepest thou?” The angels (knowing that Mary had been told by them, or other angels, that Jesus had risen) did not understand Mary’s sorrow. She said unto them, “Because they have taken away my Lord, and I know not where they have laid Him.”This statement clearly reveals how the disciples’ lack of faith had virtually destroyed Mary’s own. Fortunately the Author and Finisher of her faith was jealous for her. Poor Mary, her hope was so crushed by the disciples ridicule and lack of faith, that now she too, regardless of the angelic reports, believes Jesus to be still dead. “Jesus saith unto her, ‘Mary.’ She turned herself, and saith unto Him, ‘Rabboni’ which is to say, ‘Master”‘ (John 20:11-16). How comforting it must have been to hear that voice of love speak her name again. A voice which she, (being one of His sheep), had come to know and trust. All Jesus said was her name and her faith was restored. Oh if we would only listen when Jesus calls us by name, what healing power His voice could have for us! 2. And very early in the morning the first day of the week, they came to the sepulchre at the rising of the sun. The fact that the sun was recorded as “rising” makes this the latest trip recorded. Having already been confronted by the disbelief of the disciples Mary Magdalene now goes and finds Mary the mother of James and Salome, and they get other women. Instead of them telling the other women about Jesus’ resurrection and risk being ridiculed by them as well, they kept their secret. In pretense they continue with their original plans to take the herbs, which they had purchased after the first day of the seven consecutive days of the Feast of the Unleaven Bread, and go to anoint the body of Jesus. And as they went “they said among themselves, ‘Who shall roll away the stone from the door of the sepulchre?”‘ It was probably the two Mary’s asking this question of the other women. Like most people with a secret, they had a hard time keeping this one to themselves. So while not talking about what all they had seen earlier, they talk about what they know will be the first sign of Jesus’ resurrection that the other women will see. 5. And entering into the sepulchre, they saw a young man sitting on the right side, clothed in a long white garment: and they were affrighted. Notice how here in Mark’s account there is only “one young man” here and not “two angels?” Wouldn’t it be wonderful if instead of this being an angel, it was actually the thief on the cross next to Jesus? I’m not saying it was, but is there someone who can say it was not? The scriptures make the point how this “one young man” was clothe in a “long white garment.” It is white raiment which represents the righteousness of the saints and what better garment for the one whom by faith stood by Jesus at the end? What better reward than to be one of those privileged to declare His resurrection? Does not Matthew tell us, “And the graves were open: and many bodies of the saints which slept arose, and came out of the grave after His resurrection, and went and appeared unto many?” Who can truly tell? Certainly not I. But in case you are not hearing me, once again, I’m not saying it was without a doubt the thief on the cross . . . but then who can say it was not? 6. And he saith unto them, ‘Be not affrighted: ye seek Jesus of Nazareth, which was crucified: He is risen; He is not here: behold the place where they had lain Him. For even here we can see his reference to Jesus as being “of Nazareth” is the way the people referred to one another back then. Like “Paul of Tarsus” or “Simon, a Cyrenian,” or “Joseph of Arimathea,” or “Mnason of Cyprus.” Men identified men with where they came from. The angel in Matthew referred to Jesus as the “Lord.” This by far is the most accurate account of Jesus, “Lord.” To refer to Jesus as being from Nazareth is more the perspective of man than that of God or the angels. They know from whence He truly came. 7. But go your way, [as you were previously told], and tell His disciples and Peter that He goeth before you into Galilee: there shall ye see Him, as He said unto you. 8. And they went out quickly and fled from the sepulcher; for they trembled and were amazed; neither said they anything to any man; for they were afraid. Can you imagine Mary Magdalene going back to try and tell the disciples again what they all saw? If indeed it was the thief on the cross? Can you see her telling them that she saw the thief as well? “I saw the thief that was crucified with Jesus and he said Jesus is alive too!” I’m sure that would have gone over really big. Luke and John both mention how the women, then Mary, all told someone what they saw and heard, but not here. This time the encounter and message were not told “to any man: for they were afraid.” What were the women afraid of? The reason they told no one because they “afraid” of more and even greater ridicule. Now had this “young man . . . clothed in a long white garment” had been an angel, his angelic position would have perhaps obliged the women to go and tell. But if this “man,” was the condemned thief, what authority had he? Of course you and l, not in their situation, can readily see his authority would be of God. But put yourself in their position. Put yourself in Mary Magdalene’s, after all she had been through. What would you do? Please, do not be as they were, slow to believe all that the scriptures tell you. It truly is as Jesus said unto Thomas, “Because thou hast seen Me, thou hast believed: blessed are they which have not seen, and yet have believed” (John 20:29). Therefore I pray you too may be blessed for your belief in His resurrection. In light of the fact the Jesus’ resurrection took place on the Sabbath, and not Sunday morning, (as most have been taught), one would do well to be prayerful regarding the soundness of teaching of Sunday being the new “Christian Sabbath” or proof for ignoring the Sabbath. For if such teaching is founded solely upon the assumption that Sunday is the day that Jesus rose from the dead, then the foundation for Sunday being the new “Lord’s Day” may well be one of sand and not stone. When considering the Sabbath, I am reminded of the words of God spoken to us by His prophet Isaiah as he prophesied of the Lord’s coming judgment. “Behold, the Lord maketh the earth empty, and turneth it upside down . . . because they have transgressed the laws, changed the ordinance, [thus] broken the everlasting covenant (Isaiah 24:1-5). Notice “laws” is plural and “ordinance” is singular. Of all the Ten Commandments there is only one ordinance given, that being “Remember the Sabbath, to keep it holy.” These are sobering words that cause me to cautiously consider the wisdom of some who seemingly dismiss the Fourth Commandment but not the rest. However, please, please, do not let this be a means of divisiveness. In these times we must focus on drawing near to God and seeking Him while He may be found. The Sabbath may indeed be a blessing to those who find rest and communion with God on that day – but it is no wise a foundational stone for their salvation. Jesus Christ slain and resurrected is the only foundation for salvation in the proclamation of the Gospel. Remember, if at all possible, follow peace with all men and that true faith works by love, sacrificial love. 1Co 13:8 Charity never fails: but whether there be prophecies, they shall fail; whether there be tongues, they shall cease; whether there be knowledge, it shall vanish away. 9 For we all only know in part, and therefore we prophesy in part. 10 But when that which is perfect is come, then this which is in part shall be done away. 12 Likewise, presently we see through a glass, darkly; but then it will be face to face: now I can only know in part; but then I will know even as also I am known. 13 Right now abides faith, hope, charity, but of these three the greatest is charity. You may want to consider a question. In the last line above, ‘then went in that other disciple, which came first to the sepulcher, and he saw, and believed’ is a mystery. What did he see? If Jesus of Nazareth is risen, Jesus of Nazareth is not there. What was there that caused him to believe? WHAT DID HE SEE? The answer could exist in the previous sentence. “Then cometh Simon Peter following him, and went into the sepulcher, and seeth the linen clothes lie, and the napkin, that was about His head, not lying with the linen clothes, but wrapped together just as it had been wrapped about Jesus’ head in a place by itself” THIS SAYS WHAT IS SEEN. Peter saw the linen clothes. But, WHAT WAS SEEN. Linen clothes and the napkin that was exactly where it was when the body of Jesus was between its fibers. Now, the body wasn’t there. But the linen burial clothes, the Shroud, was there separately. The Shroud that contained Jesus of Nazareth, now the Risen Man whom the Angels called Lord, is what was SEEN. What did the second disciple see? He saw the shroud, in living color, having the body of Jesus imprinted upon it. He saw the Shroud of Turin in its originality, at the Event Horizon of the Age when the New Man was being raised from the dead. This shroud was VIVID in color. This shroud was COLORFUL, with all the blood and olive colored skin, and colorful hair, the coins covering the eyes, the scourge marks, the nail marks, the tasseled belts, the GORGET upon His throat spelling Ayin Aleph Nun, Exodus 12:21, Tsion, Lamb, which is only used once in the scriptures for Jesus was and is the Lamb of God. The evidence of the shroud illustrates several things. First, the body was levitating, suspended without gravity. I could imagine The Father holding His son between His arms with the shroud covered body as He produced the Resurrection. The shroud illustrates an unflattened body in a homogeneous wrapping where every cell of the body is visible in two distinct plans. Secondly, time was stopped. This is demonstrated by movement of the fingers evidenced in the shroud. These two event horizons were first understood by Dame Isabel Piczek. They saw the Witness of God that remained here for us. The shroud used to be filled with Life.